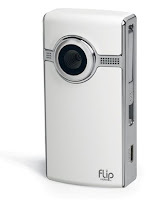 A Flip Cam with video of exclusive Rally Fighter build content. All you have to do is guess when the Rally Fighter will be completed. Sure, with this exclusive content you will likely learn a thing or two about car building and the Rally Fighter build process, but you will also get a chance to see team triumphs & late night pranks. Maybe you'll meet my girlfriend who now visits me at Local Motors headquarters because I rarely return home (we've been pulling some late nights working on the build!) You might get to hear some of Jay Rogers incredible ability to quote just about any movie you can think of. Who KNOWS what the exclusive content will include? You can win this AND the Flip Cam if you are the closest to guess the day and time the Rally Fighter build will be complete. Hint: The Rally Fighter will be premiered at SEMA on November 3rd in the "Making Green Cool Zone" (booth #30215). 1.) Price is Right Rules apply. Over-bidders are disqualified (have some faith, people!). 2.) You can only guess ONCE (yes, we check). 3.) Only the guesses which are tweeted prior to the Rally Fighter build completion will be eligible. Follow this blog or our Twitter for regular Rally Fighter build updates to help you. Wow.. that was a great gift.. who's the lucky one winner of this..? ?